I broke a Montessori rule. I wanted to create an activity for Z that would reinforce the story of Jesus calls Matthew (Matt 9:9-13). But this activity contains so many practical life work all in one that it doesn’t isolate any single skill that would help the child repeat or concentrate on developing that one particular skill. Like I said — I broke a Montessori rule. 1. Open the snap on the coin purse. 2. Unzip the coin purse. 3. Close the cash box to prepare it for coin slotting. 4. Take out coin by coin from the purse and insert into slot. 5. Open up the cash box. 6. 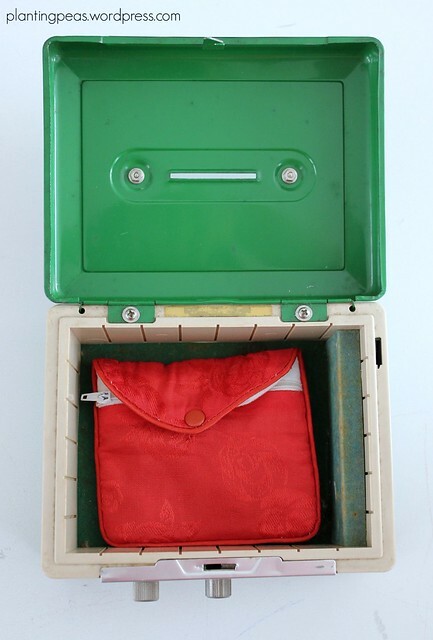 Take out coin by coin from the cash box and return back to the coin purse. 7. Zip and snap the coin purse shut. 8. Return the coin purse to the cash box. 9. Close the cash box. Turn the dials to lock if he wants to. 10. Put the activity back on the shelf. 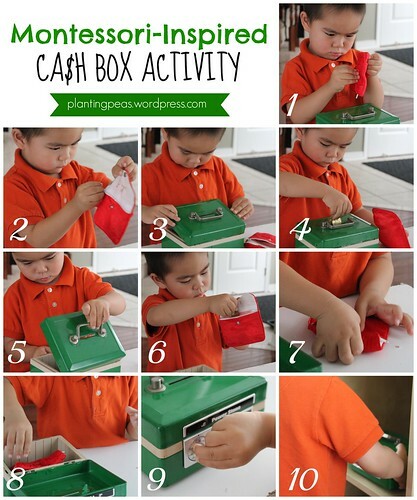 In this activity, he’s learning how to snap, zip, insert coin into slot, open a cash box, close a cash box, turn the dials to lock and unlock, remember what number he needs to align with the arrow in order to unlock and open the box, take coins out of purse, and put coins into purse. That’s a lot of skills that would have translated to a heck of a lot of trays on a Montessori shelf. I don’t get it. I broke a Montessori rule and yet I saw some pretty good results, in my opinion. I didn’t break all of the rules, in fact I followed many Montessori principles. I just broke the one about skill isolation. It’s as though the “complicatedness” of the activity was the factor that held his attention, and isolating each one of the skills would be far too easy (thus boring) for him. Despite all the different combination of skills, he could finish the work. The snapping and zipping were a bit of a challenge at first, but the purse is small enough (i.e. short zipper + one small snap) that he would reach success just before he hit his frustration point. That kept him going. In my defence, it wasn’t meant to be a Montessori activity, but more of a Bible story tie-in activity. So maybe it was the relevance of the work that contributed to the longer attention span. It was presented after a story on Matthew (Matt 9:9-13), who was a tax collector in the Bible, and so this is a very “relatable” work in terms of taking out your money to give to somebody else, and taking money from somebody else to put in your cash box. It was somewhat “real” work. We talked about what it means to be a tax collector, and what a tax collector does. We role played too. Anyway, we follow the child in Montessori. So perhaps my take-away from this should be to continue making relevant activities/work for him (story tie-in activities seem to work for Z), but isolate only those skills which need more work (zipping and snapping). I probably wouldn’t isolate a coin slotting activity for him, because he has already mastered it, so isolating it would probably bore him. Am I on the right track here? Is this what you would do too?